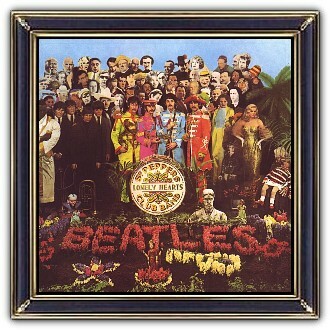 Peter Blake and Jann Haworth with more than 60 artists, writers, thinkers and figures influential to The Beatles. Adolf Hitler and Jesus Christ were requested by Lennon, but ultimately they were left out. Photography - Michael Cooper. 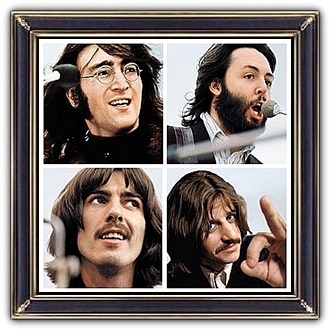 In the centre of the cover, the Beatles stand behind a drum on which are painted the words of the album's title; the drum was painted by fairground artist Joe Ephgrave. The entire lyrics were printed on the back cover. It was the first time this had been done on a rock LP. The final cost for the cover art was nearly £3.000 (equivalent to £46.104 today). An extravagant sum for a time when album covers would typically cost around £50.. The whole epochal art project proved about 60 times more expensive than any cover made before. Its influence has been immeasurable. In the guise of the Sgt Pepper band, the Beatles were dressed in custom-made military-style outfits made of satin dyed in day-glo colours. The suits were designed by Manuel Cuevas. 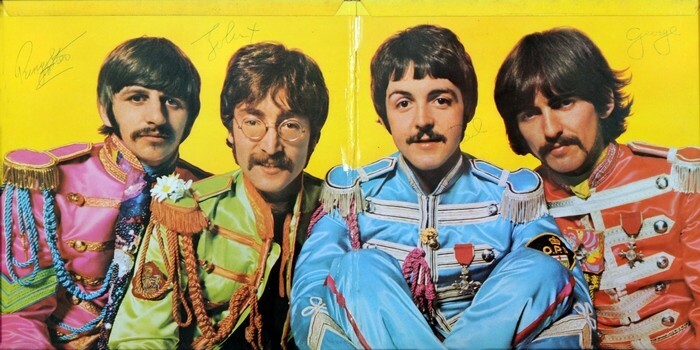 Among the insignia on their uniforms are: MBE medals on McCartney's and Harrison's jackets, the Royal Coat of Arms of the United Kingdom on Lennon's right sleeve and an Ontario Provincial Police flash on McCartney's sleeve. The Beatles were an English rock band, formed in Liverpool in 1960. With members John Lennon, Paul McCartney, George Harrison and Ringo Starr, they became widely regarded as the foremost and most influential act of the rock era . Rooted in skiffle, beat, and 1950s rock and roll, the Beatles later experimented with several genres, ranging from pop ballads and Indian music to psychedelia and hard rock, often incorporating classical elements in innovative ways. 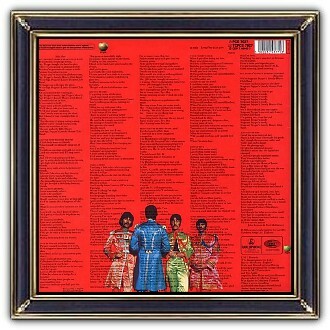 Their finest and most innovatieve material include 'Rubber Soul' (1965), 'Revolver' (1966), 'Sgt. Pepper's Lonely Hearts Club Band' (1967) and Abbey Road (1969). After their break-up in 1970, they each enjoyed successful musical careers. Lennon was shot in December 1980, and Harrison died of lung cancer in November 2001.